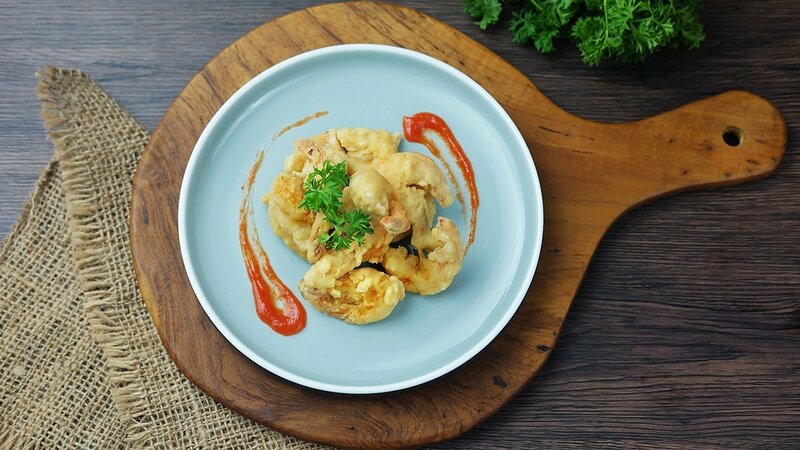 Floured shrimp is always a hit, thanks to its flavour and crunchy texture. Serve this as an appetiser or snack and watch your diners go wild! Peel the shrimp, then mix with Knorr Lime Powder water. Rinse the prawns, then drain them till dry. Split the shrimp (do not break) and remove the vein. Mix with salt, pepper and Knorr Bumbu Pelezat Rasa Ayam Rostip, then keep it overnight to marinate. Cover the shrimp with flour. Heat oil in a frying pan. Mix the flour with Knorr Bumbu Pelezat Rasa Ayam Rostip. Mix some of the flour with ice water. Coat the peeled shrimp with wheat flour. Dunk the shrimp into the ice water mix. Put the shrimp back into the flour and squeeze to create irregular texture. Fry with hot oil for 1-2 minutes.